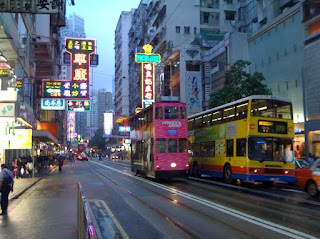 I love the whole complexity of the public transport system in Hong Kong, the little red and green mini-buses, the Toyota red n white taxis, the upstairs (and cheaper downstairs) on the Star Ferries, the regular buses and the VERY cheap trams. Best thing about the trams is simply how skinny they are as you can see here. They get through the tiniest of gaps and their narrow railtracks look almost like a model train line.